How to separate sprocket adaptor from prop shaft? Author: Subject: How to separate sprocket adaptor from prop shaft? I had my prop shaft coming lose from the engine block on my last track day. Fortunately I was going REALLY slowly as I had had a different failure (oil in coolant) and was just dragging the car to the tow truck. Very happy I made a prop catcher, as it minimised damage. Well... Now I unbolted the prop-shaft and it doesn't separate from the adaptor. I gave it a couple wacks with the rubber mallet. I sprayed WD40 on the thing... I tried to force a screwdriver between the two parts but I didn't manage. Fit the prop shaft back on the engine, put into a high gear and gently rock the car backwards and forwards. If you have got it on stands, turn the back wheels backwards and forward. May also work if you start the engine, hold it on the brakes, into first and slowly release the clutch? 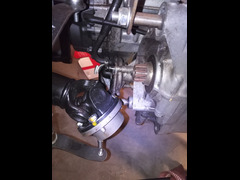 Don't know if it helps but I had to separate the propshaft from the rear diff on my 60 plate Ford Kuga and I couldn't believe how hard I had to hit it. If you have the option to take the prop off the car I would do that. Is it an issue of the constant - (mostly) one way - twisting force that will have been applied? I have problems separating sprockets from bicycle freehubs - despite them just sliding over a splined shaft because the rotation 'pulls' the sprockets into the freehub body. A couple of taps in the opposite direction to the normal rotation helps. It may be that there's just been some twisting that is bedding the adaptor onto the threads? May work if you refit the bolts, back them out about 5mm and tap the bolt heads with a hammer. I'd try a metal mallet with a thin piece of wood to protect the adapter. Give it a proper hit and it should separate it from the prop shaft. A second method would be a long piece of round bar in the sprocket hole and try to lever it off. Thank you all for the ideas! I can't use the engine to twist it apart as I can't fit the adaptor on the sprocket again. The bolt in the middle of the adaptor is dangling and doesn't get in place so that I can fit it. I'll take the prop from the car and attempt the various solutions you provided. One will for sure work! Please make sure you come back and tell us which one worked! Sorry it took me so long to get back at this. Finally today I have the parts separated! First I removed the part from under the car to be easier to mess with it. I tried putting wood on top and below and striking with the metal hammer on the wood. It didn't move. I inserted an Alan Key in the adaptor hole and wacked it with the hammer but nothing happened. I don't have a chisel so I tried with a screwdriver in the split line and some hammer blows. Nothing. Took the thing to a friendly mechanic, explained what was suggested, what I tried. Straight away he told me a screwdriver doesn't replace a chisel. He didn't even put the prop on his bench! Held it between his legs, grabbed the chisel and a smallish hammer, 2 wacks and it was split apart!!! Lesson learned, buy proper tools. Thank you all for the suggestions and, ultimately, for giving me the solution! You rock! LocostBuilders » Forum » Maintenance & Modifications » How to separate sprocket adaptor from prop shaft?